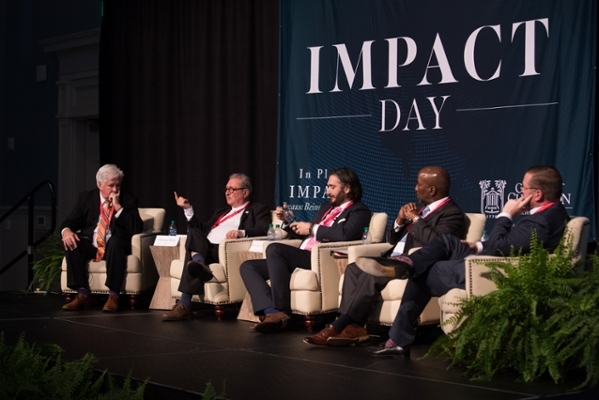 The College of Charleston School of Business is no stranger to making an impact on business students and in the local business community, but as students and business leaders gathered for the School’s first-ever Impact Day, the word “Impact” took on a new meaning. 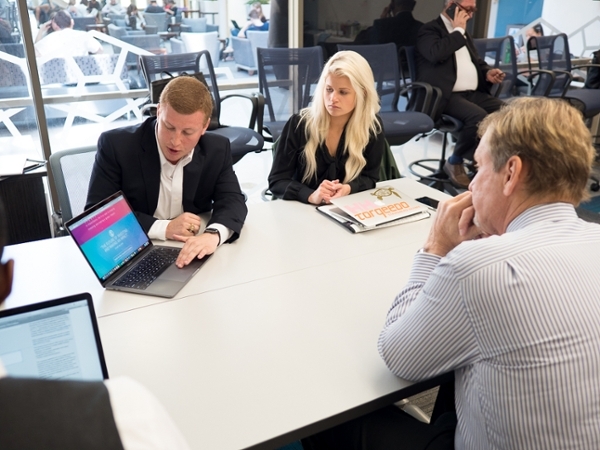 Hosted by the business school in partnership with In Place Impact, the day-long function highlighted the merits of Impact entrepreneurship and making a difference while making a profit. The event also showcased how the School of Business is fostering the next generation of Impact entrepreneurs. The visionary behind Impact Day, Board of Governors member and ImpactX (formerly ICAT) instructor, Stuart Williams, sees first-hand how business students at the College of Charleston are using Impact entrepreneurship to solve 21st century problems and views their work as a gold-standard business model. According to Williams, those who innovate solutions for society and the planet will have the greatest wealth accumulation over the next five decades. Many of these individuals, he believes, will come out of the School of Business. Enter Impact Day, an event that boasted an impressive agenda full of local, regional and international Impact experts as well as School of Business ImpactX candidates, Impact Scholars and entrepreneurship students. The day kicked off on campus with the unveiling of the new name and logo for the Interdisciplinary Center for Applied Technology (ICAT), now ImpactX. Just as its tagline states, ImpactX will “reimagine the start-up” from conception to commercialization by ensuring all businesses born out of the program are purposed to make a significant social Impact while also generating a profit. Following the unveiling, internationally renowned entrepreneur and investor Sergio Fernandez de Cordova spoke to a packed audience in the School’s Wells Fargo Auditorium about successful business models that align with the Sustainable Development Goals of the United Nations. Impact Day attendees then relocated to the Gaillard Center, where Alan Shao, dean of the College of Charleston School of Business, and Williams greeted guests and recognized participants. 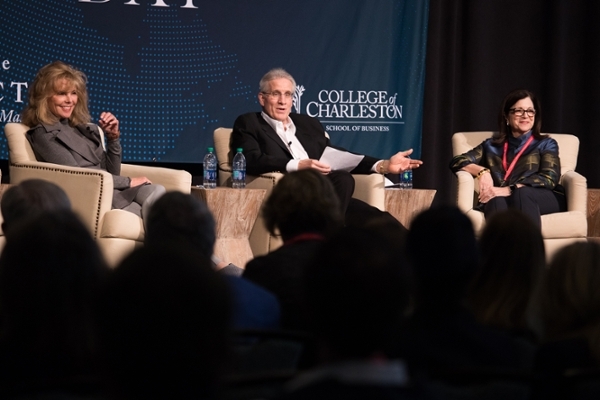 More than 250 business professionals, faculty, students and community members attended the evening events, which included a Q&A with Impact and Corporate Social Responsibility experts, a moderated panel on Impact investing as well as a fireside chat on making a difference while making a profit. The last of which featured two of South Carolina’s most esteemed business leaders and philanthropists — Darla Moore and Anita Zucker. Staying true to the School’s mission to serve our state, region and the global business world by educating socially responsible students through experiential learning, Impact Day showcased the innovative work of its business students. Student entrepreneurs filled the exhibit areas to show event attendees exactly how their businesses masterfully balance purpose and profit. A few of the student businesses featured at the event included: ImpactCents, an app that makes it easy for users to invest and make an impact around the world through microfinancing; TOTEM, human resources management software that encourages blind hiring to eliminate prejudice from the job application process; and SIQ (Social Impact Quotient), an app that enables users (both businesses and individuals) to establish a ranking for their social Impact. The night ended on an inspirational note as the Honorable James Rosebush, author of True Reagan, delivered a keynote speech highlighting President Ronald Reagan's commitment to Impact during his time in office. His words, coupled with the presentations and talks throughout the day, not only left attendees informed of the extraordinary work being done by Impact thought leaders around the globe but also forecast the future of Impact entrepreneurship in the region: bright, critical and emboldened by the School of Business.